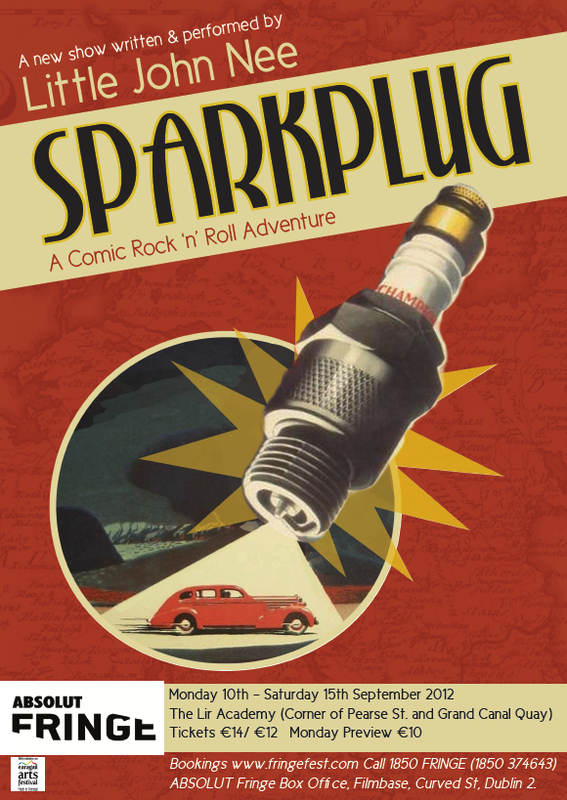 Sparkplug Callaghan: bluesman and vintage mechanic is living in his dead uncle’s disused barn. He’s got the blues bad: everyday there’s another funeral, Joe Duffy’s on the radio and the banks are putting people on the side of the road…but across the meadow he sees a vision…his boat has come in. An adventure into the heart of a surreal rural landscape that combines lyrical comic storytelling with original music and songs played on a variety of intriguing instruments! The set is cluttered with arcane instruments and vintage bric-a-brac, but Little John Nee’s one-man show is marked by an economy of musical score and storytelling style, as he sketches an offbeat portrait of Donegal life. The plot, such as it is, concerns the eponymous handyman who falls for a bohemian Belfast artist, living in her late father’s improbably dry-docked boat, while competing for with attentions of a dastdardly ex-cop. The story takes second place to mood and tone, however. Nee conjures up an atmospheric soundtrack, his array of ukuleles, melodicas and accordions amplified by imaginative audio techniques, audience interactivity and his own bluesy vocals. The understated monologue is similarly characterised by evocative vignettes, distinctive wit and wry references to political foibles. Imagine Garrison Keillor relocating to Ulster’s northwest in the company of Tom Waits and D’Unbelievables and you get an idea of Nee’s singularly enjoyable production. In this piece, Little John Nee becomes Sparkplug O’Callaghan, a singer who is compelled to sing the blues, finding cause, as he wanders around the shifting sands of the northern Tullyglen, represented by the boxes on stage that unfurl narrative props with each visiting. At one point, the boxes begin to resemble a lighthouse – an interesting symbol for this piece of storytelling which looks to search out small stories, creating an atmosphere where innocence and restlessness coexist; it’s there in the children swinging idly on the gate, and in the pensioned-off guard obsessively stalking Ruby, a local woman that has stolen his heart. This is a mesmerising piece of theatre that suggests poetry in the details, bringing a local community to life through a particular kind of language: “Crazy Horse Corcoran is going to Dublin to set a man straight, and asked me if I would officiate at a burial”, which sets a surreal tone, bringing to mind something like Katherine Dunn’s novel Geek Love, with its traveling carnival, as Tullyglen community looks forward to “vintage day”, or John McGahern, with its clear-eyed take on a world that is not as it first appears. It is a place of splendid isolation, replete with secret yearning, subtle sectarian sympathies, pet cemeteries and boats in meadows – Ireland, in other words. Margaret McLaughlin’s review: Little John Nee and his arrayment of curious-looking instruments bring the audience on a sensory journey throughout Donegal and a journey through narrative itself. His poetic stories have a sincere authenticity about them, although quite absurd and often tongue-in-cheek. Nee uses the entire stage and draws the viewer in with his audio-visual approach to storytelling. He turns puppeteer in handing out little bells to the audience which are dramatically conducted with a spanner. The transient journey brings the viewer from tale of red hen, who was buried in an pet cemetery in Donegal, to the thuggery that exists between football groups Celtic and Rangers, to disgust at the banking controversy and then back again to meet a tradesman who enterprises out of bottling the air at the top of Mt Errigal. His quick comedic wit was expressed in this gut-wrenchingly funny show drawing from nostalgic tales of comedic blues. In three words? Entertaining. Absurd. Hilarious.